Making sure the skin doesn’t burst, roasting cuy (guinea pigs) at the market, Gualaceo, Ecuador. Just because we’ve been stopped for a while doesn’t mean we don’t keep learning things – oh no. The trajectory of our learning curve keeps speeding ahead in one direction. Here’s a few things from the last few weeks: 1. If you are baking at high altitude, you have to adjust the ingredients to compensate. 2. If you stay still long enough, you find stuff out – like which local shops are willing to break the law and sell you alcohol on a Sunday. 3. If you eat guinea pigs you will upset your friends’ children. 4. If you expect your car to be fixed by a given date, you must add on at least a week, maybe two, or more. And on a related point… 4a. When you get really angry, you forget every word of Spanish you ever learned, not least the word for “angry”. 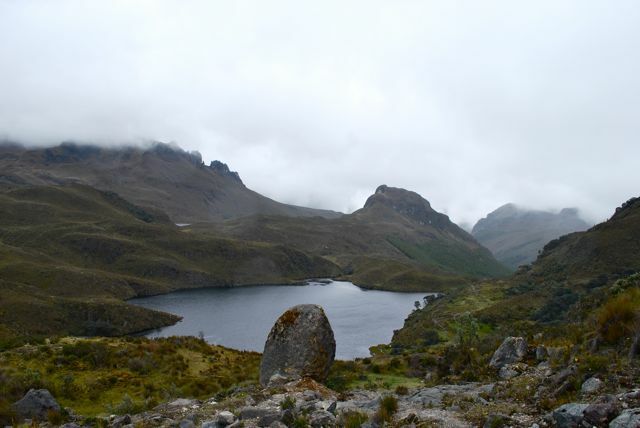 Cajas National Park – like being transported to bonnie Scotland for a day. We’d decided to travel 9 hours south from Quito and explore another part of Ecuador while we waited for our van parts to arrive from the US, and rented an apartment in the gorgeous town of Cuenca. It’s been a great base for exploring the surrounding area, like the Inca ruins of Ingapirca and Sunday markets in nearby villages. We hiked at the spectacular Cajas National Park, which – at a bracing 4,000m (13,000ft+) – was weirdly evocative of the mist-shrouded mountains and lochs of Scotland. At times we would look around and wonder if we’d been teleported back home while we weren’t paying attention. Having an apartment does run the risk of becoming spoiled – what with all these luxuries like a proper bed, consistently hot shower, oven, brick walls, toilet, that kind of thing. We’ve also enjoyed wandering Cuenca’s bars and cafes, meeting people, and generally behaving like folk who live somewhere. Guinea pig, as served to us at the restaurant. We’ve been using the time to do a little work too. Which brings me on to those cuddly rodents. While here we took the opportunity to go out and finally try one of Ecuador’s specialities, the roasted guinea pig (cuy). This week I wrote a feature about our culinary experience, and a bit of the history behind it all, for the BBC News website. While researching I discovered one of my favourite facts – that guinea pigs are neither pigs, nor from Guinea. Mainly for reasons of abject laziness, I have re-printed the article in full below. Now, the BBC is – rightly – a sensitive soul and it doesn’t like to go around gratuitously upsetting its readers. For that reason they felt forced to omit my description of the roasted guinea pig’s liver flopping out onto the plate and (ex-vegetarian) Jeremy grabbing the first bite. They also felt unable to use some of the more graphic photos of impaled guinea pigs being roasted over an open fire at the market. We have no such high standards of taste and decency, but I will say this – the photo gallery below might not be one for the kids. Things we now know to be true: One man’s meat is another man’s poison (or pet). BBC article below, or click here to go to the feature on BBC Magazine. Could I bring myself to eat a guinea pig? 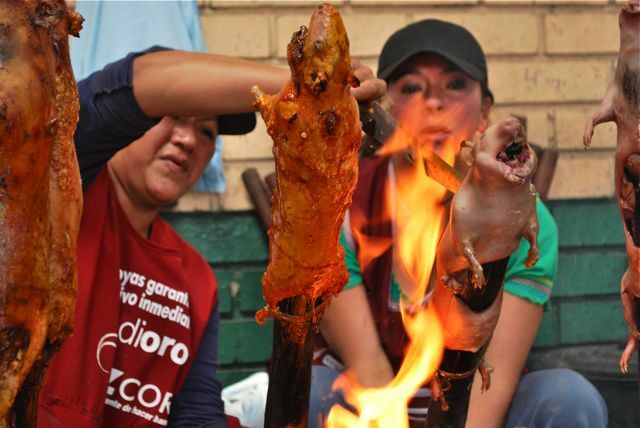 Eating roasted or fried guinea pig is an ancient tradition in parts of South America, and still common today. But in other parts of the world the rodents are cherished as cuddly, fluffy pals for children. How do you make the mental leap from cute pet to delicious meal? As a committed carnivore I’m not in the habit of attaching personalities to the meat on my plate. But this was a guinea pig, with four legs, a face and endearingly prominent front teeth. I used to have one as a pet. My husband Jeremy and I were in a restaurant in southern Ecuador, where guinea pigs are regularly served up with potatoes and corn, and have been for thousands of years. Peru, Bolivia and parts of Colombia also do so. We’d seen them being cultivated in a small rural home in Colombia, and impaled on thick rods before being roasted en masse in an Ecuadorian market. 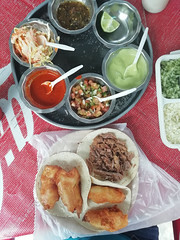 Eating traditional foods is a large part of the travel experience, so there was no way we would pass through the region without sampling this dish. 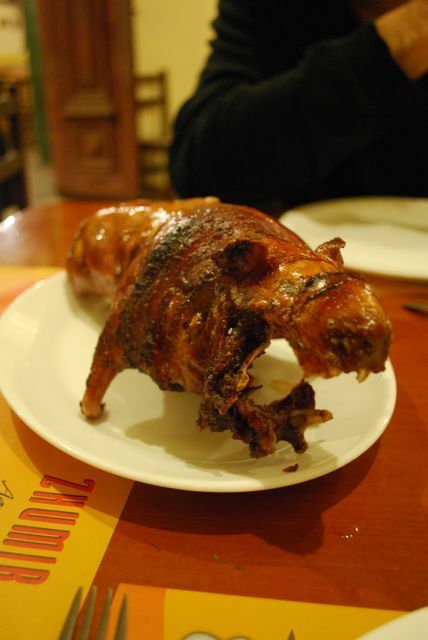 The roasted guinea pig – called cuy in South America – was brought to our table whole before being chopped into five pieces – four leg portions and the head. I considered Jet, the tufty black guinea pig who was my first pet. He was forever getting lost and his antics were the subject of a story written by eight-year-old me, which won a local writing competition. That he died in the care of friends while we were on holiday – overwhelmed by the car fumes in their garage – was one of those dramatic childhood turning points that I never really got over. Could I move on? The reaction from some of our friends on social media to our planned meal suggested cuy-eating might not become popular any time soon in Europe, where guinea pigs have been loved as pets since traders introduced them in the 16th Century. 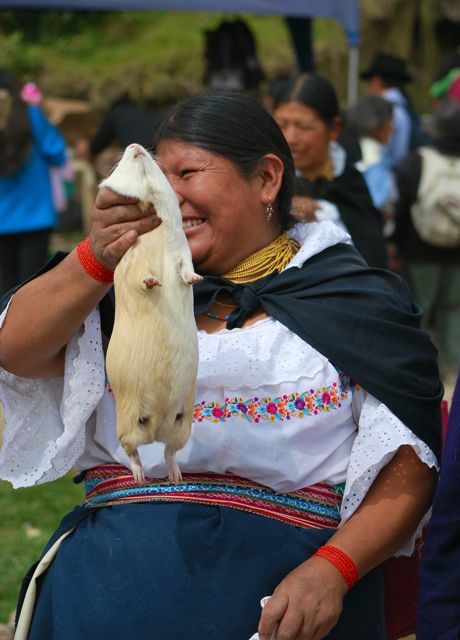 A woman brandishes one of many guinea pigs she has for sale, animal market, Otavalo, Ecuador. Briton Christopher Breen, who owns restaurant Cafe Eucalyptus in Cuenca, Ecuador, and serves guinea pig tikka masala, says there is little chance of his compatriots adding the animal to their weekly shop. “Cuy catching on in the UK? I don’t think so,” he says. It’s a line that many who are well-integrated into Ecuadorian society refuse to cross. Gary Sisk, 64, from California, retired to Cuenca 18 months ago and has otherwise embraced the local culture, but says he has no intention of eating a guinea pig. “When I first noticed cuy roasting in the market I was kind of shocked because of course we had them for pets as kids,” he says. There have been small-scale exports of the delicacy to the US, Japan and some parts of Europe – often at the behest of the Latin American diaspora – but consumption levels are unlikely to reach those of Peru, for example, where an estimated 65 million guinea pigs are eaten annually. Far higher quantities of chicken are eaten – more than 500 million per year – but guinea pig remains preferred for special occasions. It’s in Peru that archaeologists report guinea pigs were first domesticated as a food source as early as 5,000 BC, prized for their high protein levels and – although the fat content is relatively low – as a source of fat. They later became an integral part of religious ceremonies and folk medicine. To this day they are often the centre of local festivals, which are considered to be incomplete without cuyes. Their significance in Andean society is famously acknowledged in Peruvian-influenced depictions of Christ’s Last Supper, in Lima and Cusco. But it’s not all about the past. Cuy is still a popular animal to cultivate in rural and urban homes for eating on special occasions or – as they fetch a relatively high price – selling in markets or to shops. Larger-scale production also exists, often focusing on restaurants and the small export market. Indeed, some argue animals like this could be the future. Guinea pigs reproduce fast, taking up very little space and efficiently processing their simple diet of grass and vegetable scraps. Raising cattle is a drain on resources, they point out. By comparison, guinea pig, squirrel, and other rodents are “low-impact protein sources”. Matt Miller, a science writer for the US-based Nature Conservancy, is writing a book about the benefits of eating “unconventional” meats. “Many animals that some consider ‘bizarre’ or ‘unconventional’ make a lot more sense – ecologically, economically, personally – to eat than modern, industrial meat,” he says. Miller focuses on a number of rodents that are “abundant and can be sustainably harvested”, like squirrels, capybaras – the world’s largest rodent, also eaten in Venezuela – and guinea pigs. He concedes the “cultural aversion” to eating animals like guinea pigs is “huge” in many countries. Could those who have only ever seen guinea pigs as companions ever make that leap? Back at the restaurant, we wondered who would take the first bite. Jeremy was a vegetarian for 27 years until 2010, but has approached meat-eating with the scary zeal of a convert. He grabbed the first piece. Delicious. The marinade and slow roasting process, involving regular basting, had given it a tasty crackling-like skin, while the dark gamey meat was rich and oily, not unlike rabbit. Guilt tinged my enjoyment a little – just a little. I drew the line at tackling the head – popular with locals – while the ex-vegetarian devoured it. It also had a major part to play as a sacrificial animal. Annually, 1,000 white cavies were sacrificed in [Peru’s] Cuzco public square to placate the gods and prevent them from damaging crops. AND NOW IT’S TIME… FOR THE GALLERY. Click on any image to open in slideshow format. Vegetarians look away now. Partially roasted cuy (guinea pigs) at the Sunday market, Gualaceo, Ecuador. 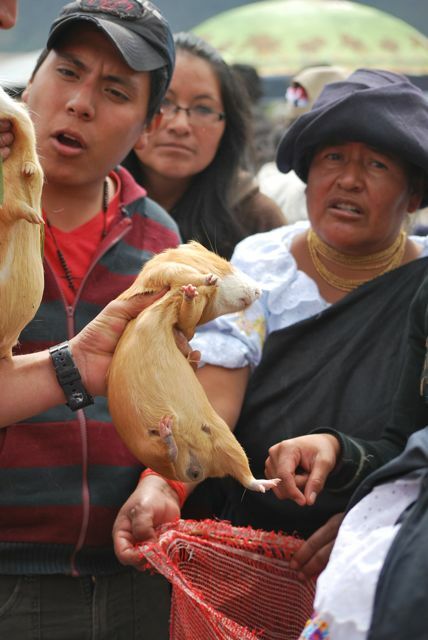 A cuy (guinea pig) is sold at the animal market, Otavalo, Ecuador. Roasting cuy (guinea pigs) at the Sunday market, Gualaceo, Ecuador. Skinned and impaled cuy (guinea pigs) ready to be roasted at the Sunday market, Gualaceo, Ecuador. Jeremy gets ready to tuck into a roasted guinea pig, Cuenca, Ecuador. The guinea pig was chopped into five pieces after being presented whole. Cuenca, Ecuador. Jeremy contemplates eating a guinea pig head… and then does. Cuenca, Ecuador. Wet grass, Cajas National Park, Ecuador. Walked up several hundred steps to get this worthwhile view of Cuenca, Ecuador. We have become proficient enough at getting ourselves lost without any help from anyone, so we really don’t need someone telling us that when we’re going north we’re actually going sideways. 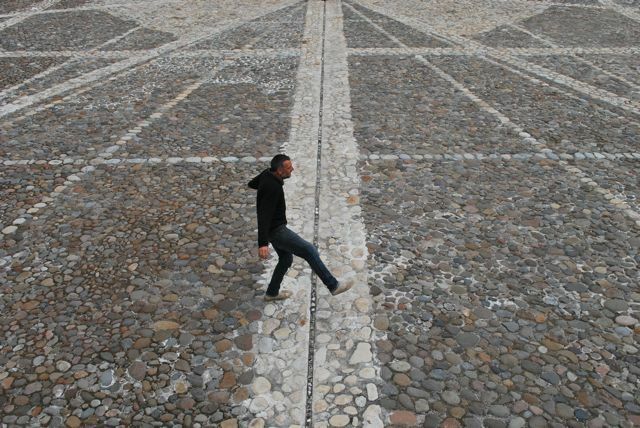 Jeremy reacts to seeing the equator by displaying his Ministry of Silly Walks repertoire. And so it was when we crossed the equator. We pulled into the ‘solar clock’ at exactly 0°, in Quitsato, Ecuador and glimpsed the much-anticipated line on the ground. We’d made it! 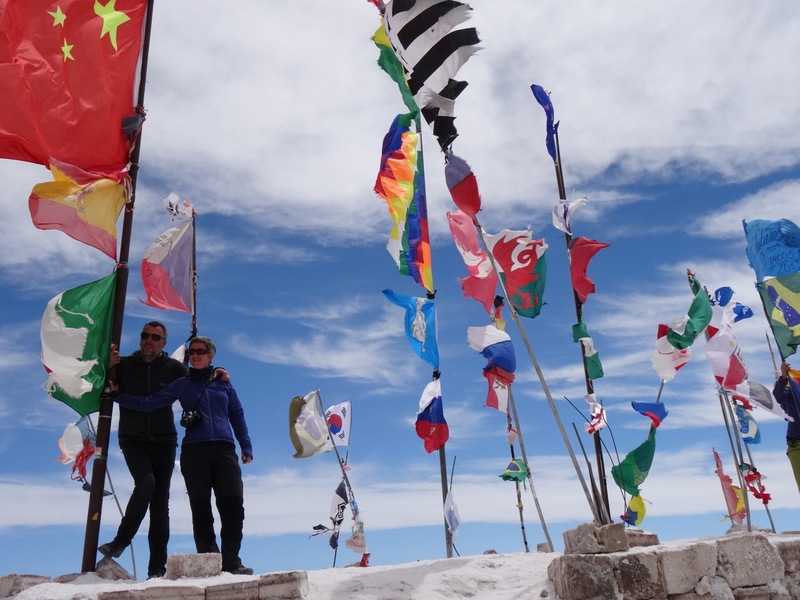 We straddled it, star-jumped over it and did funny walks across it, because that is what you must do when you encounter that magical point between the earth’s hemispheres. We were so happy. But by the time we’d finished listening to the guide’s explanation about the solstices, the position of the sun, and the spinny-spinny earth thing that my dad used to demonstrate with apples and oranges, our world had been turned upside down. Or sideways, by about 23°. I know we should have known this. Science is not our strong point – we prefer words. 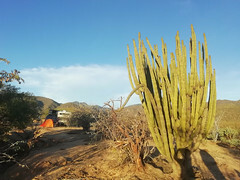 We decided to move on from the shock news that north is not up, the news that all our lives we have been lied to, and focus on looking for somewhere to camp. Miguel’s super-enthusiastic uncle insisted on a farewell photocall. Quitsato, Ecuador. The Quitsato guide, Miguel, saw we’d arrived in a campervan and asked where we were staying that night. “No idea,” we said. He said his family had some land we could camp in, just a few minutes drive away. Brilliant! We got settled in and spent much of the afternoon and evening talking to various sections of Miguel’s massive extended family, including a particularly enthusiastic uncle who questioned us for hours on every subject imagineable, and giving our Spanish skills a bit of a workout. They wanted to know what we thought of Ecuador. We were able to report that our first week had been all good. We hadn’t eaten roasted guinea pig yet, but it was on the list. That day we had tried one of the area’s specialities, bizcocho, a sweet melty flaky pastry served with a cup of hot chocolate and a finger of stringy mozzarella-style cheese. I asked the family why they served cheese with hot chocolate. They just looked at me and burst out laughing, as if I was the weird one. We’d spent the first week in the country in Otavalo, a delightful mountain town with famous animal and crafts markets, and surrounded by volcanoes and lakes. We settled into a beautiful campsite with volcano views from every angle. 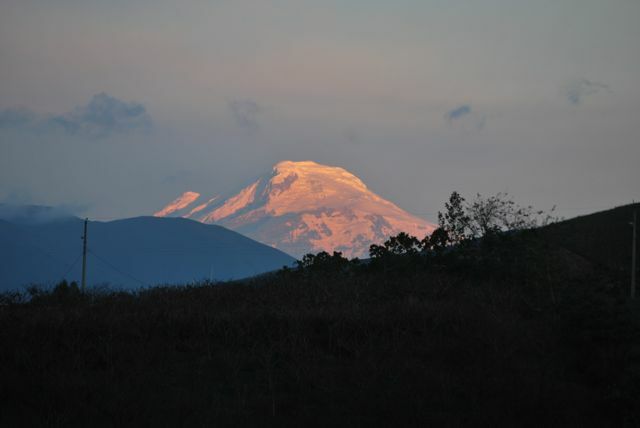 When the skies were clear we could see the shining snow-capped peak of Volcan Cayambe from our door. Volcan Cayambe from our van door, Otavalo. On market day we had a rare spree at the craft market – some winter-wear for the van, including an alpaca wool blanket and two woolly hats to brighten up the headrests. At the animal market we restricted ourselves to spectating only. Loudly protesting pigs were being lead around on strings, chickens carried around underarm like bags of rice, and guinea pigs pulled from sacks and held aloft amid passionate bartering for the price. We definitely haven’t reached the stage where we can face buying our dinner live. One of the most strikingly obvious differences between Ecuador and its neighbour Colombia is that the former still has a significant indigenous population, some of whom still wear traditional brightly-coloured wool clothing, long plaits and trilby-style Andean hats. The children are often just wearing miniature adults’ clothes, which makes them look so serious. Tiny little girls shuffle about in blouses, shawls and thick woollen skirts like – as we say in Scotland – ‘wee wifies’. On a less poetic note, the other differences from countries we have previously visited are the shiny new roads and cheaper petrol. The Ecuadorian government, under the popular Rafael Correa, has discovered that if you collect taxes you can do things like build roads. And if you renegotiate your contracts with multinationals so your own country profits from your oil, you can have cheaper fuel and more money for social projects like education and health. 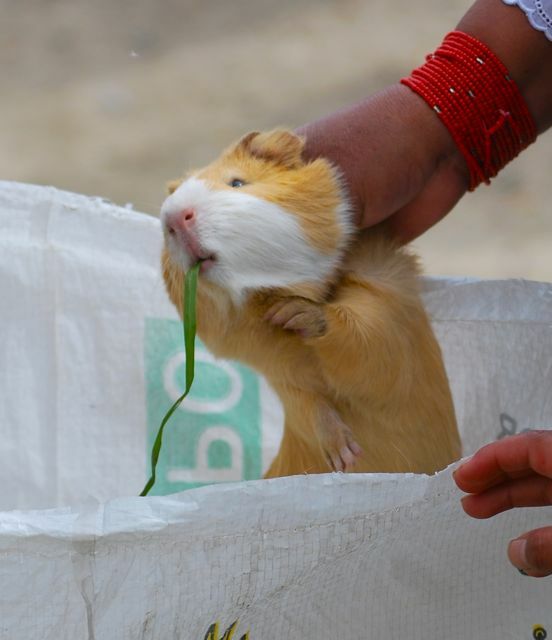 Guinea pigs for dinner anyone?, Otavalo. 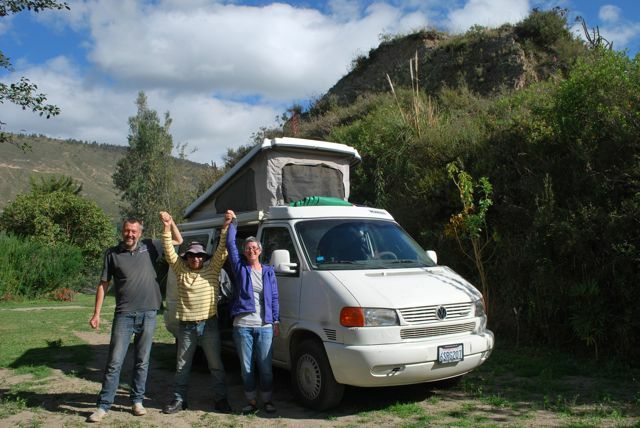 We marvelled at the smooth drive south from Otavalo, over the equator, and down to the capital city, Quito. For reasons mentioned in earlier posts, the van was still in need of some TLC, and we took it straight to a mechanic Jeremy had found online. A German former racing driver, who specialised in German cars. Now, surely, if someone could help us he was the man! We left him to investigate while we spent nearly a week exploring Quito. We had a great feeling about it – after Mexico City, it was the best capital we’d encountered. Its dramatic mountain valley setting, lovely colonial centre, good (if crammed) trolley bus system and endless cheap cafes were a treat. At 2,850m (9,350ft) it’s the second highest capital city in the world. We puffed our way up to some of its higher points to get a spectacular view over the city, and one day I left (vertigo-afflicted) Jeremy behind to take the ear-popping telefériqo (cable car) another 1,000m up to get a vista from cloud level. We spent an evening in the city’s chi-chi La Ronda area, drinking way too many jugs of canelazo and watching a modern Andean folk band that was so good it made Jeremy realise the panpipes are not something only to be played blandly by ridiculous stripey-trousered poncho-wearing hippies on Britain’s high streets. Next day we took our hangovers to a Sunday morning football match, between LDU Quito and Macará (1-0) and were entertained by constant singing and drumming throughout. Later we dragged our heavy legs up streets that make San Francisco look like a billiards table, and were rewarded with the magnificent Capilla del Hombre, an impressive and moving space dedicated to the work of Ecuadorian artist Oswaldo Guayasamín, who focused his life’s work on the oppression of indigenous poor of Latin America and the brutality of man, but also on hope for social progress. It seems a bit shallow to go from that to our campervan woes… but meanwhile at the mechanic…. after a process of elimination, and an ultra-sound clean-up of two dodgy fuel injectors, the mechanic told us one was beyond repair and needed to be replaced. 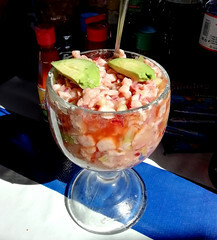 Was this available in Ecuador? If you have ever read this blog, then you will know what the answer is – of course not! One was swiftly ordered from the US, and we left the van behind and set off southwards by bus to explore the area around the town of Baños while waiting for the part to arrive. When we got there we met up for a good catch-up with fellow road-trippers Thomas and Sabine – last spotted by us in Nicaragua last June. Who knew you could ‘bake’ apple strudel on a stovetop? Thanks Sabine! 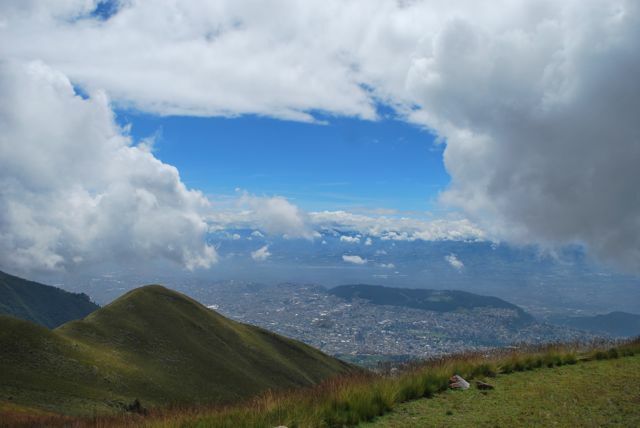 The cable car gave me a cloud-level view of Quito. From a hike high above the town we got an almost-too-close-for-comfort view of the smoking Volcan Tungurahua, which last had a major eruption in 2006 and was recently responsible for local evacuations in December 2012. Eek. We travelled to nearby Ambato for another footie match, this time a home game for Macará, against fellow bottom of the table-dwellers Deportivo Cuenca. From the stadium, aptly named Bellavista, we got a bullseye view of Tungurahua’s smoking cone. The locals were battered 5-1, and by the language being directed at some of their players and their manager, I think they would have happily tossed them straight into the volcano’s fiery throat. Baños is – unsurprisingly, given its name and location – centred around its volcanic hot springs and various spin-offs like massages and therapies. This week we walked that fine line between pleasure and pain when we took a ‘health steam bath’ in our hostel. A portly Ecuadorian lady cooked us for several minutes in a steam box that was not unlike being put in the stocks, then removed us and doused us in freezing water, before locking us back in the steam box. After three rounds of that we were blasted with a cold jet hose. It’s a similar process to the one our fuel injectors have been going through this week but, at just $4 each, we anticipate our own de-tox will turn out to be considerably cheaper. Things we now know to be true: Almost every map ever made is a lie. Below are some photos of our first couple of weeks in Ecuador. In other housekeeping news, our Colombia campspots map is now complete. A pig awaits its fate, animal market, Otavalo, Ecuador. Chicks for sale, animal market, Otavalo, Ecuador. Woman and baby, animal market, Otavalo, Ecuador. Chicken trading, animal market, Otavalo, Ecuador. Shopping at the Animal market, Otavalo, Ecuador. Many indigenous people wear spectacularly bright colours. Animal market, Otavalo, Ecuador. New purchase? Calf and owner at the animal market, Otavalo, Ecuador. Sheep walkies, animal market, Otavalo, Ecuador. Shopping for a blanket, craft market, Otavalo, Ecuador. Jewellery galore, craft market, Otavalo, Ecuador. Basket of wool, craft market, Otavalo, Ecuador. Sorry Mr Pig, but you made a delicious lunch. Otavalo, Ecuador. Shopping for dinner, food market, Otavalo, Ecuador. Set camera timer. Sprint up rock. And… look relaxed..! Laguna Grande looking ominously grey, Lagunas de Mojanda, near Otavalo, Ecuador. The Dears reach point-zero. Equator, Quitsato, Ecuador. Jeremy is pleased to be crossing the equator, Quitsato, Ecuador. Keeping a foot in both camps. The equator, Quitsato, Ecuador. Quito spreads for miles along the valley. Bolivar is the undisputed hero of most of Latin America. I can never get over the fact that Calla lilies grow outdoors here, usually in the highlands. The great thing about Latin American football matches is that there is a steady flow of food and drinks for sale in the stands. In the absence of a Spurs match, Macara vs Deportivo Cuenca will have to do. If you want this view of Banos, your legs have to pay the price. The smoking Tungurahua volcano looms large behind Ambato’s football stadium.